A large amount of Star Bits or Coins. A 1-Up Mushroom, sometimes 3. Most of the time, Mario is given a time limit to collect whatever appears. If he is able to successfully collect it within the time limit, he will receive a prize. 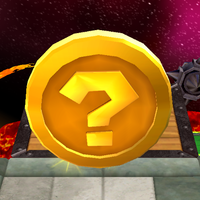 Most likely, it will be a 1-Up Mushroom, but it is also possible for it to be three 1-Up Mushrooms, a Power-up, more coins or Star Bits or, very rarely, a Rainbow Star. ↑ Super Mario Galaxy 2 Prima Official Game Guide, page 91. This page was last edited on February 23, 2019, at 14:29.